NORML spokesman says marijuana user arrested in U.S. "every 38 seconds"
(CNN) -- The U.S. should stop arresting responsible marijuana users, Rep. Barney Frank said Wednesday, announcing a proposal to end federal penalties for Americans carrying fewer than 100 grams, almost a quarter-pound, of the substance. Rep. Barney Frank's bill would radically curb federal penalties for personal marijuana use. Current laws targeting marijuana users place undue burdens on law enforcement resources, punish ill Americans whose doctors have prescribed the substance and unfairly affect African-Americans, said Frank, flanked by legislators and representatives from advocacy groups. "The vast amount of human activity ought to be none of the government's business," Frank said on Capitol Hill. "I don't think it is the government's business to tell you how to spend your leisure time." The Drug Enforcement Administration says people charged with simple possession are rarely incarcerated. The agency and the White House Office of National Drug Control Policy have long opposed marijuana legalization, for medical purposes or otherwise. Marijuana is a Schedule I controlled substance, meaning it has a high potential for abuse and no accepted medical use, according to the drug control office. iReport.com: Is it time to legalize pot? "Smoked marijuana has not withstood the rigors of science -- it is not medicine and it is not safe," the DEA states on its Web site. "Legalization of marijuana, no matter how it begins, will come at the expense of our children and public safety. It will create dependency and treatment issues, and open the door to use of other drugs, impaired health, delinquent behavior, and drugged drivers." Allen St. Pierre, spokesman for the National Organization for the Reform of Marijuana Laws, likened Frank's proposal -- co-sponsored by Rep. Ron Paul, R-Texas -- to current laws dealing with alcohol consumption. Alcohol use is permitted, and the government focuses its law enforcement efforts on those who abuse alcohol or drive under its influence, he said. "We do not arrest and jail responsible alcohol drinkers," he said. St. Pierre said there are tens of millions of marijuana smokers in the United States, including himself, and hundreds of thousands are arrested each year for medical or personal use. iReport.com: Is it time to legalize pot? There have been 20 million marijuana-related arrests since 1965, he said, and 11 million since 1990, and "every 38 seconds, a marijuana smoker is arrested." Rob Kampia, director of the Marijuana Policy Project, said marijuana arrests outnumber arrests for "all violent crimes combined," meaning police are spending inordinate amounts of time chasing nonviolent criminals. "Ending arrests is the key to marijuana policy reform," he said. Reps. William Lacy Clay, D-Missouri, and Barbara Lee, D-California, said that in addition to targeting nonviolent offenders, U.S. marijuana laws unfairly target African-Americans. Clay said he did not condone drug use but opposes using tax dollars to pursue what he feels is an arcane holdover from "a phony war on drugs that is filling up our prisons, especially with people of color." Too many drug enforcement resources are being dedicated to incarcerating nonviolent drugs users, and not enough is being done to stop the trafficking of narcotics into the United States, he said. 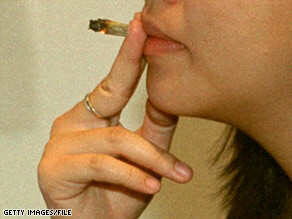 Being arrested is not the American marijuana smoker's only concern, said Bill Piper of the Drug Policy Alliance Network. Those found guilty of marijuana use can lose their jobs, financial aid for college, their food stamp and welfare benefits, or their low-cost housing. The U.S. stance on marijuana, Piper said, "is one of the most destructive criminal justice policies in America today." Calling the U.S. policy "inhumane" and "immoral," Lee said she has many constituents who are harassed or arrested for using or cultivating marijuana for medical purposes. California allows medical marijuana use, but the federal government does not, she explained. House Resolution 5843, titled the Personal Use of Marijuana by Responsible Adults Act of 2008, would express support for "a very small number of individuals" suffering from chronic pain or illness to smoke marijuana with impunity. According to NORML, marijuana can be used to treat a range of illnesses, including glaucoma, asthma, multiple sclerosis, HIV/AIDS and seizures. Frank, who is chairman of the Financial Services Committee, said that about a dozen states have approved some degree of medical marijuana use and that the federal government should stop devoting resources to arresting people who are complying with their states' laws. In a shot at Republicans, Frank said it was strange that those who support limited government want to criminalize marijuana. Asked whether the resolution's passage would change his personal behavior, Frank quipped, "I do obey every law I vote for" but quickly said he did not use marijuana, nor does he encourage it. "I smoke cigars. I don't think other people should do that. If young people ask me, I would advise them not to do it," he said. If HR 5843 were passed, the House would support marijuana smokers possessing up to 100 grams -- about 3½ ounces -- of cannabis without being arrested. It would also give its blessing to the "nonprofit transfer" of up to an ounce of marijuana. The resolution would not address laws forbidding growing, importing or exporting marijuana, or selling it for profit. The resolution also would not speak to state laws regarding marijuana use.